(Nurse Duffy) 14th April 2019 beloved wife of the late William, loving mother of Paul, Mona, Kevin and John and a much loved mother-in-law and grandmother. Funeral from her home, 62 Dunlade Road, Killywool on Wednesday at 9.30 am for 10 o'clock Requiem Mass in Star of the Sea Church, Faughanvale. Interment afterwards in the adjoining cemetery. Family flowers only please. 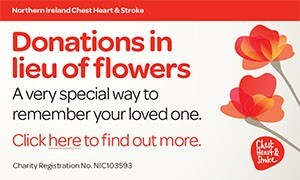 Donations in lieu of flowers if wished to Alzheimer's Society, Sevenoaks, Derry, BT47 6AL. Queen of the Most Holy Rosary, pray for her. I am sorry to tell you that Rosaleen DUFFY has passed away.